Posted on Monday, August 15th, 2011 at 12:00 pm. Follow along as Su Beng, author of “Taiwan’s 400 Years of History,” makes his first trip across the U.S. in nearly 20 years! Su Beng, is a ninety-two year old Marxist revolutionary, formerly an undercover Chinese Communist agent, would-be assassin of Chiang Kai-shek, historian, author of “Taiwan’s 400 Years of History” and lifelong Taiwan independence activist. “Taiwan’s 400 Years of History” was the first, most comprehensive book written on the subject, but it was immediately banned in Taiwan. 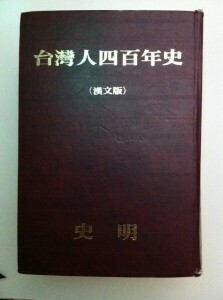 The 2000+ page Chinese language version of the book, was published in 1980. This seminal book has and continues to influence generations of Taiwan independence activists. In the 1980’s and 90’s, while still exiled in Japan, he made annual trips to Europe, Brazil and North America, built connections with overseas Taiwanese and widened his underground network of activists worldwide. This is his first visit to the U.S. since returning to Taiwan from Japan in 1993. Help welcome him when he visits your local city! **Call Mr. Lee at 973-454-3179 to make a reservation. Sponsored by FAPA-YPG of NY & NJ. Sponsored by TAA- Washington D.C. Sponsored by FAPA-YPG- Washington D.C.
Stay tuned for more updates on Su Beng’s appearances elsewhere in the country.